When I was approached by Sainsbury's Magazine to write a piece about popular holiday destinations around the UK and favourite local foods and places to eat I was delighted to contribute. However when I received the full brief I was in somewhat of a quandary. How on earth could I possibly choose only 3 Scottish foods that readers on holiday could either buy to eat there or take home. Even more tricky only 4 recommended places to eat throughout the whole of Scotland to cover everything from fine dining to tea rooms. It's akin to being asked to pick your favourite child! I started with a seriously long list for both which I whittled down with the help of some of my Scottish food blogging colleagues. Shout out to Keep Calm & Fanny On, Farmersgirl Kitchen, Lost In Food and Elizabeth's Kitchen Diary for their input. 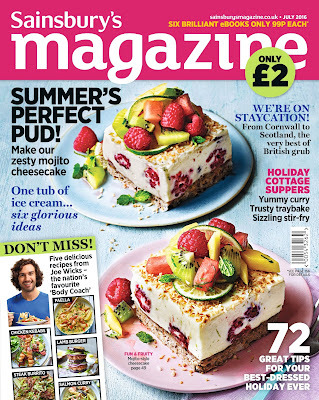 Do pick up a copy of the magazine which is onsale instore now until 3rd August. There are similar features to cover the whole of the UK from other local bloggers. 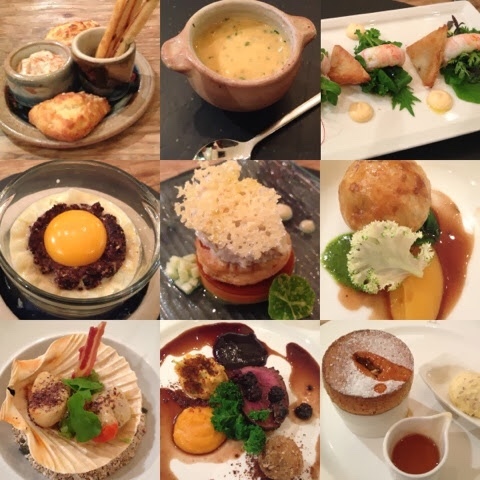 Cornwall by Anna of The Cornish Life, Wales by Kacie of The Rare Welsh Bit, South Coast by Elinor of Beach Hut Cook, Norfolk & Suffolk by Leah of Roots & Toots and The Lake District by Alan of Cumbria Foodie. 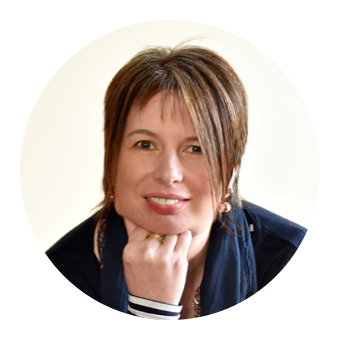 You can also click here to listen again to my Podcast on Share Radio UK extolling the foodie virtues of a Scottish Staycation. 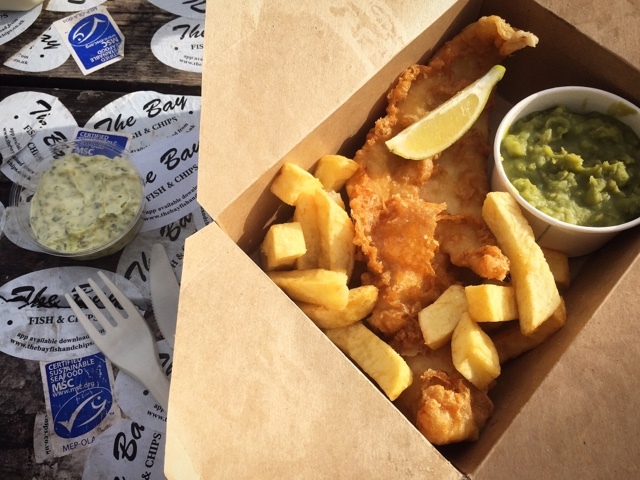 A multi award winning fish and chip shop located on the seafront in picturesque Stonehaven which champions locally sourced and sustainable produce. Check out the specials board for the catch of the day including details of which boat it’s come from. Be prepared to queue, but it’s well worth the wait. If you’ve room for desert try Aunty Betty’s Ice Cream Shop next door. 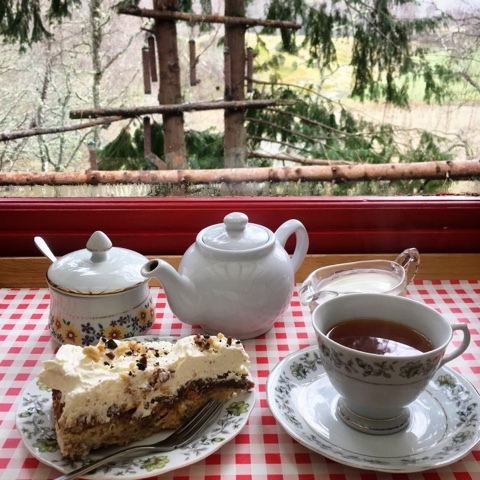 Named as one of Britain's best cake shops by Dan Lepard, The Potting Shed is located in the old potting shed of a Nursery within the Cairngorms National Park. Tea and cake is served up on mismatched vintage crockery and you can choose from an amazing selection of freshly baked Scandinavian gateaux style sponges. The piece de resistance is however a large viewing window onto a wildlife feeding station where you can watch a huge variety of birds and red squirrels. You’ll be made welcome at Mhor 84 whether you arrive dressed to the nines or in full walking or cycling gear accompanied by a wet dog. The perfect pit stop on the Rob Roy way serving great food throughout the day. Amazing cakes (meringues to die for!) 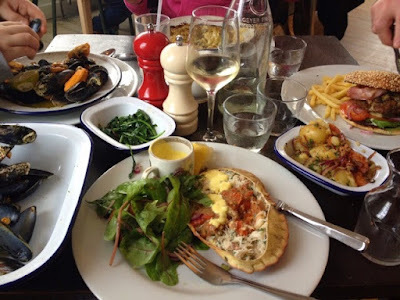 and wonderful fresh seafood in a shabby chic yet stylish setting with an atmosphere so relaxed you’ll want to linger a while. Be sure to checkout the games room with pool table and jukebox. Well worth making the journey ‘over the sea to Skye’ for this world renowned restaurant. Set within the bare stone walls of an original croft house such a remote fine dining destination really shouldn’t work. But it does. Serving the very best of seasonal produce home-grown, reared and caught on or around the island with the kitchen lead by head chef Scott Davies who was runner-up on Professional Masterchef in 2013.The Chef’s Table experience is well worth the additional charge and if you can stretch to a night at the ‘house over by’ your experience will be complete. The growing season for raspberries in Scotland is short but sweet. Scottish berry growers have a reputation for producing the tastiest fruit around. Blairgowrie in Perthshire is the raspberry capital of the UK earning the nickname ‘Berry Town’. Grab yourself a leaflet and follow Scotland’s Berry Trail to find farm shops and pick your own opportunities. Enjoy straight from the punnet, make your own jam or try the traditional cranachan desert of whipped cream, whisky, honey toasted oatmeal and fresh rasps. The regional speciality food of the North East corner of Scotland is the Buttery, also known as a Rowie or Aberdeen Roll. Originally made for Aberdeen fishermen who needed a roll that would not become stale during the two weeks plus that they were at sea. They can best be described as a dense, round, flaky, flattened, buttery, salty croissant like roll. Butteries are available from bakeries and supermarkets both loose and prepacked. They are delicious warmed and spread with jam, honey or golden syrup for breakfast. An Arbroath Smokie is a hot-smoked haddock with PGI status. 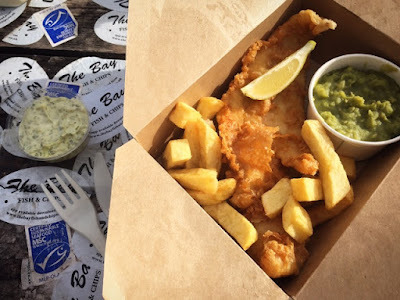 As such the name can only be used to describe haddock, smoked in the traditional manner, within an eight kilometer radius of Arbroath. Find it at fishmongers and farmers markets where the smokies will be tied in pairs using hemp twine. If you can get them hot off the barrel all the better. If not, enjoy them warmed through under the grill or on the BBQ. Perfect for breakfast flaked into scrambled egg. Oooh, congrats on the feature! We are actually planning a trip round Scotland next year, so I will keep some of these in mind. 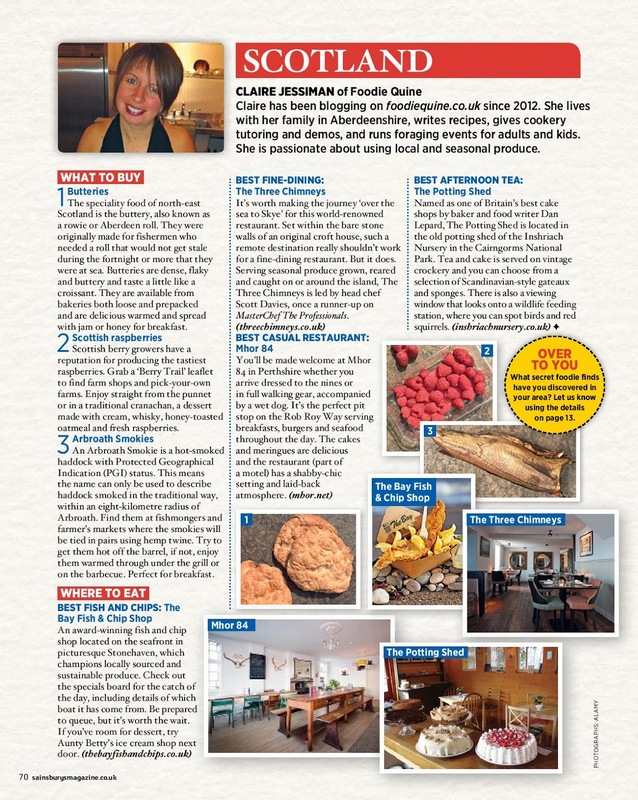 Well done on a fab article, Claire and thanks for the mention. I don't think I contributed much other than my love of Arbroath Smokies and Scottish raspberries. We have so much good food in Scotland, we are very fortunate. Well done - it's great to be in print, isn't it? Congratulations for the feature! Will have to make a not of the three places you suggested and check them out the next time we visit Scotland! I desperately need to see more of Scotland. Especially now you have told me about butteries. Im gonna be needing to try them!